Crisp 'N Bake Air Fry Toaster Oven is rated 3.2 out of 5 by 186. Rated 2 out of 5 by Cooldp from Please add directions not sure how to use product, no real instructions. No times or temps for baking only air fry that did not come with machine. Had to find air fry times on website. Never have had this experience before. Cooked pizza turned out good, cooked fries with the air fryer, liked them. No guidance whatsoever with other cooking methods other than air fry. I think adding some instructions would raise the reviews of this product. Rated 2 out of 5 by ToddlerMom from It was great while it lasted!! I happily used this almost daily since I got it for Christmas. I have a toddler and the air fryer feature was great for making snacks and easy finger foods without the extra grease at home. For reasons I cannot begin to understand, It just died on me. The toaster doesn't work on ANY feature at all!!! It's really breaking my heart that I can't give my baby the food that he's asking for because this appliance decided to stop working at dinnertime. The fact that this air fryer toaster oven didn't even last six months with regular use is very disappointing! Rated 4 out of 5 by Karen Deffler from My first Air Fryer Just bought one of these products. I read the reviews before using. I did use a little cooking spray on the drip pan and basket beforehand. This really helped with the clean up although the drip pan seems to be of poor quality ( it sratched up quite a bit) I was dissappointed to find that my basket was already bent when I opened the box too. Is there anyway to get a replacement basket? I would also like to find some replacement drip pans and other acessories for this item. Instructions were good but no cook times ( I copied the link you posted though) Items cooked well and tasted really good. I look forward to using the air fryer a lot! I like that it's bigger and seems easier to use that other air fryers. Rated 3 out of 5 by Nonickname from No cookbook or recipes with it. I just bought this air fryer/ oven. And like others no cookbook, no recipes, no cooking temp for the air fryer. Which is very important for proper cooking. And the fan doesn't come on at any other setting except air fryer. What temperature does the air fryer cook at? Why no cookbook or recipes with it. Rated 1 out of 5 by RitaReed from CONFUSING Just purchased air fryer (TO3215SS) but thinking about returning it because after setting it up I discovered that the directions are useless. No guidance on times to prepare any meals, just a standard "don't touch when hot" warning and minimal set up instructions. I'm surprised more details aren't provided -- at least a recipe book would be helpful. Rated 3 out of 5 by Julie44 from No product manual/cookbook I bought this today for the air fryer feature. There are no instructions or cookbook with my oven. I messed around with it and my food was raw after 60 minutes. I ordered a cookbook off of Amazon and will try again. I want this to work! Do you have cooking guide for air crisp toaster oven? Fist time trying any type of air fryer and toaster oven. Confused after reading guide. Thank you for offering your feedback regarding your Black+Decker TO3215SS. I'm sorry to hear that you were somewhat disappointed with the use and care manual included with your oven. Here is a link to a cooking guide for your oven. http://prodprotect.com/articles/air-fryer-guide/TO3215SSD I'm confident that your oven will provide exceptional performance, but if you ever need assistance with it, I'd be happy to help. Please contact us at youropinionmatters@spectrumbrands.com and reference ID number 41775638, so I can address any of your concerns. What is the depth of this unit? I want to know how far it will stick out from my kitchen counter top wall. thanks. Thank you for your question. This oven measures approximately 18 inches wide, by 15 inches deep, by 11.5 inches high. Thank you for offering your feedback regarding your Black+Decker TO3215SS. I'm sorry to hear that your use and care manual was not included with your oven. 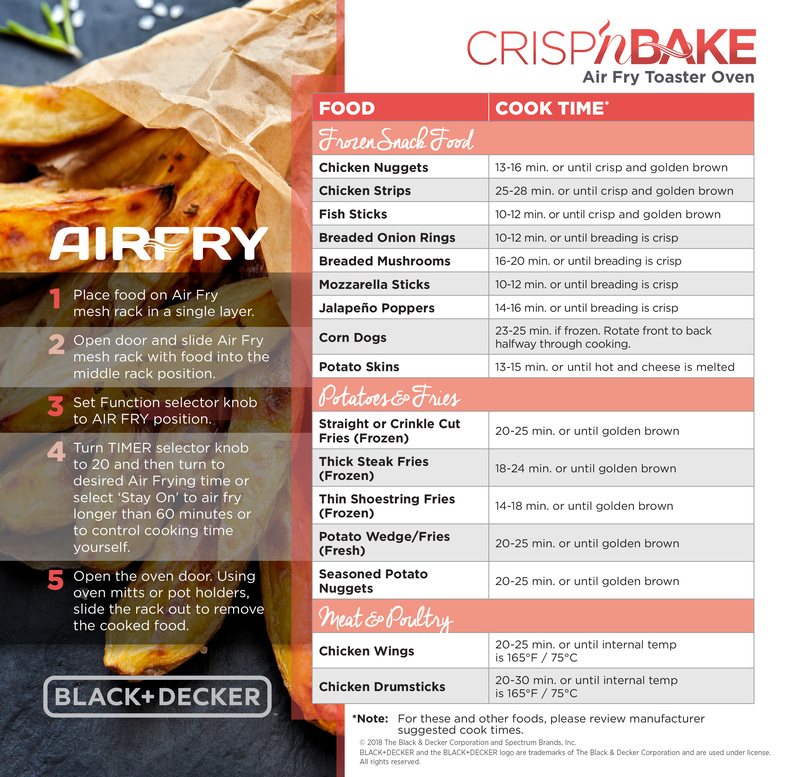 Here is a link to the product page where your use and care manual can be downloaded, along with a link to a cooking guide for your oven: http://www.blackanddeckerappliances.com/products/cooking-appliances/convection-and-toaster-ovens/to3215ss-crisp-n-bake-air-fry-toaster-oven.aspx http://prodprotect.com/articles/air-fryer-guide/TO3215SSD I'm confident that your oven will provide exceptional performance, but if you ever need assistance with it, I'd be happy to help. Please contact youropinionmatters@spectrumbrands.com and reference ID number 41773982, so I can address any of your concerns. Why is it that when I use the bake function the heating element at the top of the oven is on? Should it work this way? The top of my food burned because I used the baking pan and wasn't expecting it to heat from the top. Convection ovens always have top and bottom elements on same time for faster even cooking. I have this item, since it did not come with recipes I looked over the net. Most say to air fry at a certain temperature. How is that possible when the air fry and temperature controls are on the same dial? It looks like either - or - is that right? I have This Black&amp; Decker air fryer/toaster oven and another brand that has a basket for air frying. The latter has pushbutton controls which set the temperature according to the food you are preparing. They recommended time for Air Frying is comparable across these two differently styled air fryers. I have prepared steak and chicken (wings and wingettes) on both models and have found that the actual times are approximately the same though the B &amp; D model seems to air fry faster. Both models do say to check the food. I recommend using a food thermometer. There is an art to betting used to air frying. B &amp; D sells an air-fry cookbook on Amazon. Given the number of questions raised they could, at the least put a PDF version of ore thorough directions and a cookbook with air-fry specific recipes online. They could also place professional videos online. I can't say for sure but I prepared chicken wings in a basket air fryer at 390&deg; for about 28 minutes (flipped them halfway). Cooked chicken wings in this B &amp; D for 24 minutes (did not flip). Checked half-way. Both were crispy. B &amp; D seems to cook faster than basket style air fryer. Will check sooner next time when cooking wings in B &amp; D air fryer/toaster oven. I placed a 12&quot; ruler inside to test this and it fit (middle shelf) though had very little room so spare. How do you use the drip tray with the air fryer basket? Instructions say to put the air fryer basket on the middle or lower rack position, but then the drip basket cannot also go in the unit. I don't want to drip oil/grease down onto the elements! Hello KimG, I was told that you do not use the drip tray when using the air fryer basket. The air needs to circulate around the food for even cooking.